4 Paws Training is a dog training business in Fort McMurray, Alberta. Instruction focuses on positive reinforcement techniques and relationships between owners and their canines. 4 Paws Training was started in 2005, as an opportunity to continue training dogs for agility competitions. Puppy kindergarten, obedience and other classes were added with the increased demand for learning from qualified trainers. Through the years a wide variety of classes and seminars have been offered at 4 Paws Dog Training. In 2017, 4 Paws Training, made the decision to focus primarily on Dog Sports and Private Instruction. Koralee has been passionate about animals all her life. Her first dog Teddy was the catalyst to creating 4 Paws Dog Training. Koralee competed with Teddy in agility for 9 years. Teddy was in the elite level of agility and was the first dog from McMurray to attend the North American Dog Agility (NADAC) Championships. Over the years she was asked to share her knowledge of agility. Koralee regularly attends training opportunities and seminars to enhance her teaching and handling skills. She has competed at NADAC Championships finishing in the top 5 on 6 seperate occasions with different dogs. She is currently working towards being a judge in the sport of agility. 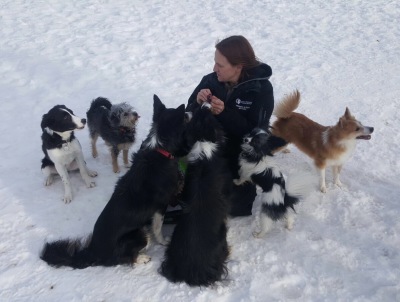 Koralee is the proud owner of 2 border collies, Ember & Karma and Rizzo, a mixed breed rescue. Koralee is a certified Trick Dog Instructor, through “Do More With Your Dog” and has Pet First Aid Training. 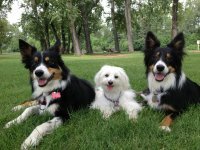 Koralee, Ember and Karma are also members of the PAWs for people (Pets and Wellness Pet Therapy) program.